Despite a number investigations using rapid sequencing and comparative genomic techniques, attempting to characterise the phenomenon of varying degrees of virulence within the Mycobacterium tuberculosis species, the underlying causes for this still remain largely unexplained. The Beijing lineage of M. tuberculosis has received much attention due to a reported increased pathogenicity and global dissemination. In order to better understand these varying states of virulence, a GCxGC-TOFMS metabolomics research approach was used to compare the varying metabolomes of a hyper- and hypo-virulent Beijing strain of M. tuberculosis, and subsequently identify those metabolite markers differing between these strains. Multi- and univariate statistical analysis of the analysed metabolome data was used to identify those metabolites contributing most to the differences seen between the two sample groups. A general decrease in various carbohydrates, amino acids and lipids associated with cell wall structure and function, were detected in the hyper-virulent Beijing strain, comparatively. Additionally, components of mycothiol metabolism, virulence protein formation and energy production in mycobacteria, were also seen to differ when comparing the two groups. 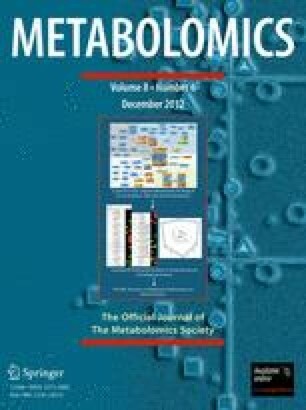 This metabolomics investigation is the first to identify the metabolite markers associated with an increased state of virulence, indicating increased metabolic activity, increased growth/replication rates, increased cell wall synthesis and an altered antioxidant mechanism, all of which would contribute to this organisms increased pathogenicity and survival ability. The online version of this article (doi: 10.1007/s11306-012-0424-6) contains supplementary material, which is available to authorized users.